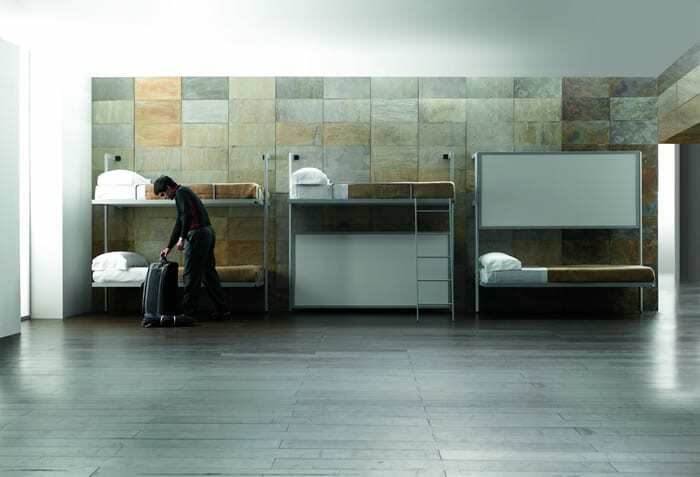 La Literal bunk beds from Sellex are a great way to maximize space and many love them. It is ideal for small apartments but also for spaces like colleges, hostels, teen rooms, guest rooms and also represent a space saving idea for your cottage. If you are thinking to choose loft or bunk beds, its important to reflect over the amount of space you have. These Spanish furniture manufacturers can save you a lot of space, because you’ll have basically two beds taking up one area if deciding to use their ideas. Sellex was founded in 1977 in San Sebastian, and right from the beginning all its efforts were devoted to the promotion of Design Furniture for Equipments. SELLEX has received the most prestigious Awards, National and International, being specially proud of the National Design Award 2011 which is awarded to companies as a recognition to its work and devotion. The innovative folding bunk bed system allows to enjoy all the comfort of the bed at night and to count on an extra room during the day. These pieces of furniture typically include a twin bunk bed above and another one below, and here is also the case. But unlike the usual bunk beds, La Literal is not furniture for kids. Its designer, Lievore Altherr Molina, intended these pieces of furniture for adults. Built with safety in mind. You can improve functionality and style in a room with the Sellex furniture. This double bunk bed has a secured ladder for easy access to the upper bed and its getting fixed to the wall. You can use the bed in a youth bedroom, guestroom or anywhere you need a versatile solution. These wall beds have been created with the help of the latest Spanish technology and the quality of the materials make them ideal for long term use.